For a number of industries including pharmaceutical, chemical, and biotechnology, vacuum pumps are equipment of high laboratorial-importance as they are used to maintain pressure and achieve filtration in various application. On the back of increased research and development activities by vendors of diverse industries to gain greater shares, the demand in the global laboratory vacuum pump market is projected to expand at a CAGR of 4.8% during the forecast period of 2017 to 2025. The analysts of this report have estimated that the stockholders connected to the value chain of the global laboratory vacuum pump market will be able to share from an opportunity worth US$1,165.2 by the end of 2025. This is substantial increment to the evaluated valuation of the market at US$1,686.9 mn in 2017. In terms of volume, it has been estimated that more than 4.5 million laboratory vacuum pumps would be required across the world, which will ensure a prosperous foreseeable future for the global vacuum pump market. Advancements in the technology to achieve desired vacuum via modern pumps, in a sealed and cost-efficient manner, is another key driver of the laboratory vacuum pump market. Players of this market have been consistently introducing products that are a progression over the former equipment and gaining greater shares. On the other hand, strict government regulations, particularly in the healthcare segment, and fluctuations in the cost of raw materials are a few restraints over the market for laboratory vacuum pumps. On the basis of product type, the laboratory vacuum pumps market has been segmented into dry vacuum pumps and rotary vane vacuum pumps. Rotary vane vacuum pump are mechanical vacuum pump that operates through a rotary positive displacement. The pumping system consist of a vane that moves rapidly between an inlet and outlet, a housing, and an eccentrically installed rotor. As compared to rotary vane vacuum pump, dry vacuum pump requires less maintenance, medium or variable vacuum range. Moreover, dry vacuum pump are Oil-less pumps and dry running pump. All these factors makes dry vacuum pump attractive in the current market. On the other hand, the rotary vane vacuum pumps segment is anticipated to expand at a relatively faster CAGR of 5.1% than the dry vacuum pumps segment. This is owing to its high level of displacement capacity and ability to function with lesser technicalities. As demand for technological innovation, scientific instrumentation and advancement in vacuum pumping technology in laboratory sector and process industry sector is driving the rotary vane vacuum pumps segment across the world. As of 2017, North America was the most lucrative region in the global laboratory vacuum pump market and is anticipated to remain so until 2025 too, when the region is estimated to provide for a demand worth of US$1,165.2 mn. 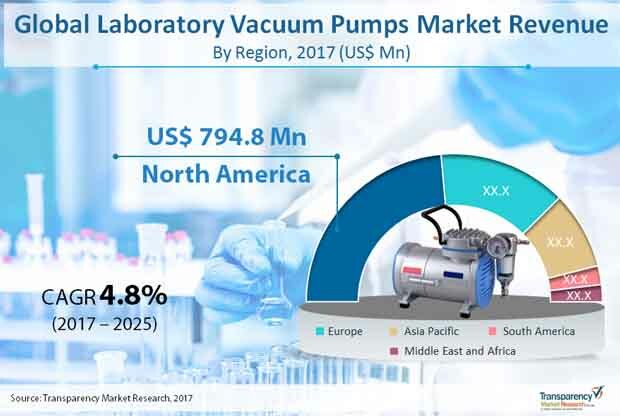 There are various factors driving the North America laboratory vacuum pumps market such as increasing number of process industries and technological innovations in scientific instrumentation. The local vendors are more focused on increasing the partnership with international service providers, which enables them in gaining advanced technologies. However, rapid industrialization in the emerging economies of China and India are primed to transform Asia Pacific into highly profitable region towards the end of the forecast period. The Asia Pacific laboratory vacuum pump market is estimated to be worth US$434.7 mn by the end of 2025, with the demand expanding at an above-average CAGR of 5.3% during the forecast period of the report. Atlas Copco AB, Welch Vacuum - Gardner Denver, ULVAC, Inc, Oerlikon Leybold Vacuum GmbH, EBARA Corporations, Wenling Tingwei Vacuum Equipment Co, Edwards Limited, KNF Group, Pfeiffer Vacuum, Tuthill Corporation, Graham Corporation, Dekker Vacuum Technologies, Inc., and Sterling SIHI GmbH are some of the key players in the global laboratory vacuum pump market. This report on the global laboratory vacuum pumps market provides analysis for the period 2015–2025, wherein 2016 is the base year and the period from 2017 to 2025 is the forecast period. Data for 2015 has been included as historical information. The report covers market dynamics including drivers, restraints opportunities, and trends expected to influence the laboratory vacuum pumps market growth during the said period. Advancement in vacuum pumping technology are playing a major role in the driving the global laboratory vacuum pumps. The study provides a comprehensive analysis on market growth throughout the above forecast period in terms of revenue estimates (in US$ Mn), across different geographies. The Laboratory Vacuum Pumps Market has been segmented on the basis of product type, and geography. Based on product type, the market has been segmented into dry vacuum pumps, and rotary vane vacuum pumps. Geographically, the report classifies the global laboratory vacuum pumps into North America, Europe and Middle East and Africa, Asia Pacific (APAC), and South America; the regions are analyzed in terms of revenue generation and the volume shipments in laboratory vacuum pumps. Furthermore, region wise prominent countries covered in the report include the following - U.S, Canada, UK, , Germany, France, China, Japan, India, Brazil, South Africa and GCC. The report also includes competition landscape which include competition matrix, market share analysis of major players in the global laboratory vacuum pumps based on their 2016 revenues and profiles of major players. Competition matrix benchmarks leading players on the basis of their capabilities and potential to grow. Factors including market position, offerings and R&D focus are attributed to company’s capabilities. Factors including top line growth, market share, segment growth, infrastructure facilities and future outlook are attributed to company’s potential to grow. This section also identifies and includes various recent developments carried out by the leading players of laboratory vacuum pumps. The report also includes key developments in laboratory vacuum pumps market. Porter five force analysis which identifies bargaining power of supplier, bargaining power of buyer, threat from new entrant, threat from substitute and threat from competition in laboratory vacuum pumps is also included in the report. Value chain analysis included in the report would present the different stake holders present in the laboratory vacuum pump market. It also identifies raw material supplier services providers and distribution channels of this laboratory vacuum pumps market. Regional and Segment trends have also been added in laboratory vacuum pumps. The report also covers segment wise comparison matrix, market attractiveness analysis and market positioning of key players for all regions covered in the scope of study. Moreover the report cover global policy and regulation frame work for laboratory vacuum pumps market. The laboratory vacuum pumps market report covers opportunity assessment analysis for each product by region. Comparison matrix includes segment growth matrix, 2017 - 2025 (%), segment revenue and volume contribution, 2017 - 2025 (%), and segment compounded growth matrix (CAGR %). Market attractiveness identifies and compares segments market attractiveness on the basis of CAGR and market share index across North America, Europe & Middle East and Africa, Asia Pacific, and South America. Company profiling includes company overview, major business strategies adopted, Key offerings for customers of laboratory vacuum pumps, prominent automotive parts and their brands listed and market revenues for year 2014 to 2016. The global players profiled in the global laboratory vacuum pumps include EBARA Corporations, KNF Group, Wenling Tingwei Vacuum Equipment Co, Edwards Limited, Pfeiffer Vacuum, Welch Vacuum - Gardner Denver, ULVAC, Inc, Oerlikon Leybold Vacuum GmbH, Atlas Copco AB, Tuthill Corporation, Graham Corporation, Dekker Vacuum Technologies, Inc, Sterling SIHI GmbH, and others players are planning to enter into the laboratory vacuum pumps.